Paulus Orosius (/ˈpɔːləs ɔːˈroʊʒiəs/; born c. 375, died after 418 AD) — less often Paul Orosius in English — was a Gallaecian Chalcedonian priest, historian and theologian, a student of Augustine of Hippo. 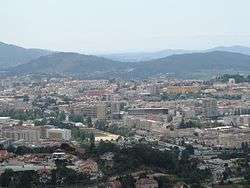 It is possible that he was born in Bracara Augusta (now Braga), then capital of the Roman province of Gallaecia, and which would be the capital of the Kingdom of the Suebi by his death. Although there are some questions regarding his biography, such as his exact date of birth, it is known that he was a person of some prestige from a cultural point of view, as he had contact with the greatest figures of his time such as Saint Augustine of Hippo and Saint Jerome. In order to meet with them Orosius travelled to cities on the southern coast of the Mediterranean Sea, such as Hippo Regius and Alexandria. However, this idea is flawed as authors writing immediately after Orosius’s death use the name Paulus. In fact, even Casimiro Torres Rodríguez, one of the main scholars of Orosius’s life, indicates that Paulus might be his Christian name and Orosius his native name, a theory that cannot be entirely dismissed. Born in Braga: this idea is most widely accepted as it has the most evidence supporting it. If he was not born in Braga, it is likely he was born in the area around the town. This idea is supported by Orosius’s own works and two letters written by Saint Augustine, the 166th and the 169th. Contemporary histories indicate that from an early age Orosius was loquacious and erudite, alluding to statements to this effect made by both Saint Augustine and Pope Gelasius I. In any case, any discussion of Orosius’s youth is pure speculation and conjecture because, as discussed above, there is little knowledge regarding this period of his life. The visit to Palestine had a double purpose: Orosius wanted to discuss a number of theological topics with Saint Jerome, particularly those relating to the soul’s origins, and Saint Augustine wanted closer ties with the thinker and to gather information regarding the Priscillianists, Origenists and the Pelagian heresy. In reality, it would seem that Orosius’s main task was to assist Jerome and others against Pelagius, who, after the synod of Carthage in 411, had been living in Palestine, and finding some acceptance there. Orosius met with Pelagius on Saint Augustine’s behalf and he represented the orthodox party against the Pelagians at the Synod of Jerusalem that was held in June 415. Orosius’s first act on meeting Saint Jerome was to hand him the correspondence that he had brought from Saint Augustine. This implies that the journey was always conceived of as a return journey as Orosius would have to deliver the letters from Saint Jerome back to Saint Augustine. In parallel to this, the relics of Saint Stephen were uncovered at the end of 415 and part of the find was given to Orosius in order that he could take it back to Braga. This marks both the start of his return journey and, from our current perspective, a new epoch in Orosius’s life that is lacking in sources of information for its study. Given that Saint Stephen’s relics were uncovered on 26 December 415, Orosius must have departed from Palestine after that date. 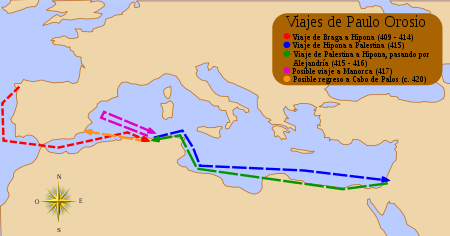 Although his idea was to travel to Braga, he was forced to pass through Hippo as it is known that he delivered letters from Jerome to Saint Augustine, it is also generally agreed that he passed through Jerusalem and Alexandria, although it is not known if he visited the latter on his outward journey, on his return journey or on both occasions. The traditional theory states that the book was finished between 416 and 417. Support for these dates comes from the fact that the Liber Apologeticus does not mention Orosius’s work as a historian, and the prologue refers to Book XI of the City of God by Saint Augustine, which was not published until 416. In order to justify how Orosius managed to write seven books in such a short time it is argued that he could have written summaries that were later filled out. Very little information is available regarding the life of Paulus Orosius after the publication of his Histories. It is known that he was in Menorca where he used the remains of Saint Stephen in attempts to convert members of the Jewish community to Christianity, but the date of his death is not known. This lack of information regarding Orosius could be due to cooling of relations with Saint Augustine, who never makes any clear unambiguous references to Orosius’s "Histories" once they have been published. Gennadius of Massilia considers that Orosius lived at least until the end of the Roman emperor Flavio Honorio’s mandate, which lasted until 423. However, there is no news of Orosius after 417 and it seems unlikely that such an active author would go six years without publishing anything new. There are other theories, from a sudden death to a range of legends that talk of Orosius’s final arrival in Hispania and his founding of a monastery near to Cabo de Palos where he ended his days, although this latter idea now seems improbable. Although Paulus Orosius’s most important book was the Historiae Adversus Paganos, his other two surviving books must also be taken into account: Commonitorium and Liber Apologeticus. The full name of his first book is Consultatio sive commonitorium ad Augustinum de errore Priscillianistarum et Origenistarum (in English: Warnings and Reminders by Augustine Against the Errors of the Priscillians and the Origenists). Its chronology is littered with the same grey areas as Orosius’s biography. In principle it is a book intended for Saint Augustine and therefore it must have been written before Orosius arrived in Africa, between 409 and 414 as discussed above. The second chronological limit is 415, which is traditionally considered to be the date when Augustine’s book Liber ad Orosium contra Priscillianistas et Origenistas was published, in which Augustine replies to Orosius’s Commonitorium. The book is not only aimed at Saint Augustine but was also preceded by conversations with the saint. It not only describes Orosius journey to Africa, but also summarises the beliefs of Priscillianism and Origenism, and it asks for Saint Augustine’s advice regarding these theological issues, thereby exposing some of Orosius’s theological doubts. 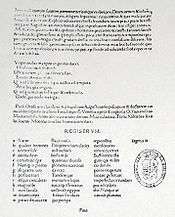 The full name of Orosius’s second book is Liber Apologeticus contra Pelagium de Arbitrii libértate. It was published at the time of Orosius’s participation in the Council of Jerusalem in 415. The book is the result of a theological debate during which Archbishop John II accused Orosius of heresy due to his idea that man cannot remain free of sin, not even with the help of divine intervention. In order to defend himself from these accusations Orosius wrote Liber Apologeticus, in which he describes his motives for participating in the synod, he was invited by Saint Jerome, and rejects the accusation of heresy made against him. However, neither of these two books are of a historical nature, despite containing elements that help in the reconstruction of Orosius’s life. Page from a manuscript of Orosius’s Histories held in Florence. 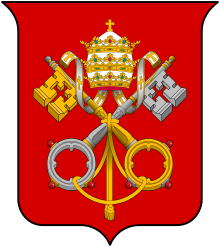 Paulus Orosius’s masterpiece is Historiae Adversus Paganos, the only history book that he wrote, which allow us to gain an insight into the historiographical methodology of the Spanish priesthood. It is not possible to be certain as to when it was written as there is no single theory that is unanimously accepted by all historians. The most common estimate places the drafting of the book between 416 and 417. Miguel Ángel Rábade Navarro offers a clear and concise definition on Orosius’s history in one of his articles on the author. In this article Rábade calls the Histories a "universalist history with an apologetic and providentialist character, whose main aim is to compare a pagan past with a Christian present, through their followers, their actions and their geographical and temporal location". Be this as it may, the book had a definite origin and a clear purpose. 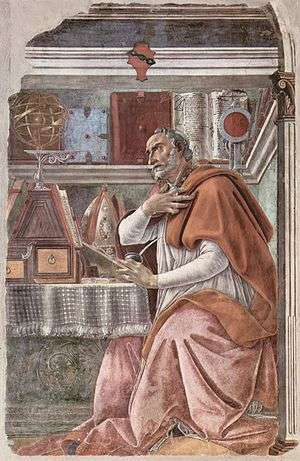 The books origins were a response to Saint Augustine’s express desire for a book that would complement his De Civitate Dei which is a history focused on the pagan races. The date of the book is not our main focus here, what is more important is Orosius’s objective in responding to Saint Augustine’s request by writing a book aimed at proving that Rome’s decadence – it should be remembered that Rome was sacked by Alaric I in 410 – had nothing at all to do with the fact that the Romans had relatively recently converted to Christianity. The Universalist nature of Orosius’s work is perhaps its most notable aspect. In fact, despite the lack of agreement regarding all other aspects of Orosius’s life, including his biography and his works, most experts agree on the universalist nature of this work, including classicists such as Marcelino Menéndez y Pelayo and even more modern historians such as Torres Rodríguez. In addition, his works are not only identified as universalist but as the first Christian universalist history, or put another way, the last classical universalist history. Orosius’s basic innovation in dealing with the four empires theory was to introduce Carthage between Macedonia and Rome, which is something that scholars such as García Fernández point out as one of Orosius’s defining and definitive acts. Another important characteristic of Orosius’s “Histories” is defined as patriotism. There are two clearly defined positions regarding Orosius’s patriotism, a more traditional view espoused by Torres Rodríguez and a more novel view as recently outlined by García Fernández. Torres Rodríguez’ theory refers to patriotism is the sense that Orosius places special emphasis on the events that took place in Hispania. This is normal given Orosius’s origins, but it can be thought of not only as patriotism but also as Hispanism. Examples of this tendency include narratives of events in the “Histories”, that occurred in Braga or the fact that Orosius himself was charged with transporting the reliquaries of Saint Stephen. It is even pointed out that Orosius’s narrations are sometimes used by current day groups of Galician nationalists. On the other hand, in 2005 García Fernández made an explicit allusion to Torres Rodríguez’ theory when he stated that it was an exaggeration to characterize Orosius’s historical methodology as “patriotic”. This was a rejection of nearly all of the statements made by Torres Rodríguez on this matter. García Fernández used the idea of “localism”, which was a fashionable idea amongst historians at the beginning of the 21st century. This idea argues that beyond "Hispanism” Orosius shows a “benevolent attitude” to Hispania. Orosius is thereby able to present the past as a series of adversities with concrete examples, from Noah’s flood to the shipwrecking of ships in the Mediterranean Sea, and the future as something positive despite the reality of the times in which he lived. Another traditional criticism of Orosius’s work relates to this dichotomy of pessimism/optimism, which often causes him to offer a narrative that in many ways lacks an objective viewpoint. This divides historians into those that view him as biased and others that reject this criticism and justify his approach by saying that Orosius viewed history in the same way as Christians view life. Put another way, his approach is justified as being founded in the author’s Providentialist character. The narrative ability of Orosius should also not be overlooked. The author had a clear objective: that the Christians be defended from the non-Christian Roman’s accusations that the sacking of Rome in 410 was a reprimand because the Christians had forsaken the city’s traditional pantheon of gods. Orosius’s narrative abilities in forwarding this argument therefore went beyond the pessimism/optimism duality that was discussed in the previous section. His basic idea is that the past is always worse than the present, because it is always further from the true religion. Another important aspect of Orosius’s work is the importance he placed on geography in his work as a historian. This is shown in his geographic description of the world in the second chapter of the first of the seven books that comprise the Histories. The assumed falling out of Paulus Orosius and Saint Augustine at the end of the former’s life does not seem to have had a negative effect on the distribution and impact of his Histories. Despite the previously highlighted criticisms of his work, Orosius’s books were considered to be successes from virtually the day of their publication. His Histories was considered to be one of the main works of Spanish historiography right up until the time of the Reformation. This success has, to a large extent, meant that his other works have also been conserved. ↑ David Rohrbacher, "Orosius," in The Historians of Late Antiquity (Routledge, 2002), pp. 135–137. Rohrbacher bases the date of birth on Augustine's description of Orosius as a "young priest" and a "son by age" in the period 414–418, which would place his age at 30 or younger. Rohrbacher further speculates (p. 137) that Orosius may have died in a shipwreck while attempting to return to Hispania after visiting Palestine and Africa, since nothing is heard of him after 418, which is also the likely date of completion of his last book. 1 2 3 4 Martínez Cavero, Pedro, “El pensamiento…”, p. 22. 1 2 Martínez Cavero, Pedro, “El pensamiento…”, p. 35. 1 2 3 Martínez Cavero, Pedro, “El pensamiento…”, p. 57. 1 2 3 4 Rábade Navarro, Miguel Ángel, “Una interpretación...”, pp. 377. 1 2 Torres Rodríguez, Casimiro, “Paulo Orosio…”, p. 81. 1 2 3 4 5 6 Torres Rodríguez, Casimiro, “Paulo Orosio…”, p. 82. 1 2 Torres Rodríguez, Casimiro, “Paulo Orosio…”, p. 16. 1 2 Torres Rodríguez, Casimiro, “Paulo Orosio…”, p. 19. 1 2 Martínez Cavero, Pedro, “El pensamiento…”, p. 26. In this section he refers to the author M. P. Annaud-Lindet. ↑ Theodor von Mörner was a 19th-century historian who wrote De Orosii Vita Eiusque Historiarum Libris Septem Adversus Paganos. ↑ Martínez Cavero, Pedro, “El pensamiento…”, p. 24. ↑ Martínez Cavero, Pedro, “El pensamiento…”, p. 25. ↑ Torres Rodríguez, Casimiro, “Paulo Orosio…”, p. 27. ↑ Pedro Martínez Cavero refers to a discussion of this theme by J. E. López Pereira in his “Cultura y literatura latinas en el NO peninsular en la latinidad tardía”. ↑ Pedro Martínez Cavero this time refers to author G. Fainck. ↑ Both Martínez Cavero and Torres Rodríguez maintain this in books mentioned in the bibliography. ↑ Drawn by the author from information contained in Martínez Cavero, Pedro, “El pensamiento…”, Torres Rodríguez, Casimiro, “Paulo Orosio…” and others. ↑ Martínez Cavero, Pedro, “El pensamiento…”, p. 29. ↑ Paulo Orosio, “Historias…”, III 20, 6-7, cited in turn by Martínez Cavero, Pedro, “El pensamiento…”, p. 30. ↑ Martínez Cavero, Pedro, “El pensamiento…”, p. 39. ↑ Martínez Cavero, Pedro, “El pensamiento…”, p. 42. ↑ Martínez Cavero, Pedro, “El pensamiento…”, p. 43. ↑ Martínez Cavero, Pedro, “El pensamiento…”, p. 45. ↑ Martínez Cavero, Pedro, “El pensamiento…”, p. 47. 1 2 Martínez Cavero, Pedro, “El pensamiento…”, p. 52-53. 1 2 Beltrán Corbalán, Domingo and others, “El Commonitorium...”, p. 65. ↑ Beltrán Corbalán, Domingo and others, “El Commonitorium...”, p. 66. ↑ Beltrán Corbalán, Domingo and others, “El Commonitorium...”, p. 67. ↑ Beltrán Corbalán, Domingo and others, “El Commonitorium...”, p. 69. ↑ Beltrán Corbalán, Domingo and others, “El Commonitorium...”, p. 71. 1 2 Torres Rodríguez, Casimiro, “Paulo Orosio...”, p. 36. 1 2 Torres Rodríguez, Casimiro, “Paulo Orosio...”, p. 35. ↑ More detailed information regarding the various theories regarding the date of writing can be found in the sections “Final years” and “Disappearance” of this article. 1 2 García Fernández, Francisco José, “La imagen de Hispania...”, p. 287. 1 2 García Fernández, Francisco José, “La imagen de Hispania...”, p. 286. ↑ Torres Rodríguez, Casimiro, “Paulo Orosio…”, p. 75. ↑ Alonso Ñúñez, José Miguel, “La metodología…”, p. 373. 1 2 Alonso Ñúñez, José Miguel, “La metodología…”, p. 379. ↑ Rábade Navarro, Miguel Ángel, “Una interpretación…”, pp. 378. ↑ Rábade Navarro, Miguel Ángel, “Una interpretación…”, pp. 381. 1 2 Torres Rodríguez, Casimiro, “Paulo Orosio…”, p. 76. 1 2 Torres Rodríguez, Casimiro, “Paulo Orosius…”, p. 77. ↑ García Fernández, Francisco José, “La imagen de Hispania…”, p. 293. ↑ García Fernández, Francisco José, “La imagen de Hispania…”, p. 294. 1 2 García Fernández, Francisco José, “La imagen de Hispania…”, p. 298. ↑ Torres Rodríguez, Casimiro, “Paulo Orosio…”, p. 63. 1 2 Torres Rodríguez, Casimiro, “Paulo Orosio…”, p. 65. 1 2 Alonso Ñúñez, José Miguel, “La metodología…”, p. 377. 1 2 Torres Rodríguez, Casimiro, “Paulo Orosio…”, p. 64. ↑ Torres Rodríguez, Casimiro, “Paulo Orosio…”, p. 66. 1 2 Torres Rodríguez, Casimiro, “Paulo Orosio…”, p. 68. 1 2 Alonso Ñúñez, José Miguel, “La metodología…”, p. 376. 1 2 Torres Rodríguez, Casimiro, “Paulo Orosio…”, p. 53. ↑ Torres Rodríguez, Casimiro, “Paulo Orosio…”, p. 56. ↑ Torres Rodríguez, Casimiro, “Paulo Orosio…”, p. 80. ↑ Old English text, with original in Latin, edited by H. Sweet, 1883. Beltrán Corbalán, Domingo, González Fernández, Rafael y Martínez Cavero, Pedro, “El Commonitorium de Orosio: traducción y comentario”, en Faventia: Revista de filología clàssica Nº 21, 1999, pp. 65.83. The complete text (in Spanish) from the article can be found on http://ddd.uab.es/pub/faventia/02107570v21n1p65.pdf. Consulted in October 2008.